Finance is one of the most sought after disciplines in MBA. Though finance is a diverse industry but primarily students are taught about internal finance, costing, investment banking, cash management, corporate finance, merchant banking etc. A student with an MBA degree in finance can get opportunities in banks, financial institutions and consultancies. Graduates who have good communication skills, ability to handle tough situations and good people management skills can opt for MBA in HR. During your course tenure, you’ll learn about recruiting, employee management, team building, training, employee health & safety. Students, who have an information technology background or are interested in software or database development, can go for MBA in IT. After completing MBA in IT, one can hold professional positions in areas such as IT system/network administration, IT management consultant and IT strategist. MBA in marketing is the most dynamic field. An MBA in marketing programme offers specialised education in brand and product management, consumer behaviour, promotion management and other marketing dynamics. If you earn an MBA degree in marketing management, you can work as Brand Manager, Media Planner, Product Manager and Marketing Analyst. Pharmaceuticals companies are now looking for graduates with specialised MBA degree so that they can better manage the pharmaceutical business. 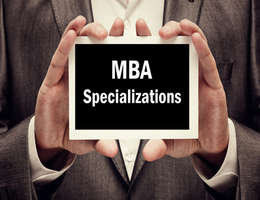 More and more colleges are offering MBA in this trendy field. Students who have done graduation in pharmaceutical or biotechnology fields can go for MBA in pharmaceutical programme. Students also have a number of other choices in MBA specialisations including MBA in Media, Telecommunications, Rural Management, Agri-business, Operations, Supply Chain Management, Retail, etc. The only criteria to enter MBA colleges offering these courses is to clear MBA entrance tests such as NMAT 2015 exam, CAT, XAT, MAT and other college specific entrance exams. Choose the specialization that matches with your career goals.